Controversial is probably the best word for War on Terror [$1.99]. Originally a board game conceived by Terror Bull Games in 2003, War on Terror has precipitated everything from bans to death threats – true story, I swear. As you can imagine, when the iOS version was released, there was significant concern about it being forcibly annulled from the App Store. It wasn’t, and I’m damn well glad for that because War on Terror is the sort of game you should at least play once. Fans of the title should be forewarned, however. The iOS version is significantly watered down compared to the original. There is no Axis of Evil. There are no off-board negotiations or dealings. Defeated players do not become terrorist nations. You don’t even get situational cards. Nonetheless, that doesn’t change the fact that War on Terror is surprisingly fun and, once you’ve realized the genius behind it, devilishly clever. But we’re moving a little too fast. Let’s take a few steps back and take a look at how the game actually plays. When you first start the game, you’ll be asked to select your avatar (this is purely cosmetic, by the way) and the number of players you wish to play against. After that, you’ll be dropped into a world map with a few nations under your control. To win, you must accumulate a certain amount of liberty points. How do you do that? By taking over continents (each continent rewards you with a certain amount of points). I’m totally serious about this. If you cringed at that, you should probably stop reading now because it gets a lot worse. Did you know that the total annihilation of a player in War on Terror is usually accompanied with fanfare and a declaration that the aforementioned individual has been liberated. Ahem. Moving on. The actual gameplay itself is relatively straightforward. During each turn, a set of dice is rolled and countries with the corresponding number will reward its owner with a certain amount of money. You’ll also be able to do things like establish alliances (these seldom seem to help), declare war on others, develop the countries under your ownership (the better developed the country, the greater the revenue you receive from them), indulge in a spot of terrorism (they’re surprisingly effective), build defenses (protect a country against radioactive assaults or common-place rabble; it’s your choice) and even initiate nuclear attacks (exactly what you think it is). Complex as all that might sound, it’s not. War happens when you click on an adjacent nation and select the appropriate option. Victory is even less hands-on; a win is determined by whether or not your dice rolls are above a five. Such is the case for everything else as well; it’s all a matter of pointing and clicking. 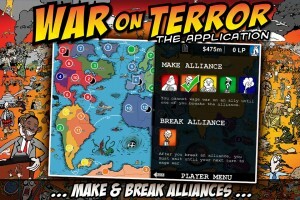 However, what makes War on Terror shine is the way the game enforces the need for proper accountancy. For example, you can wage war as much as you like – just make sure you have a minimum of forty million in your bank. Want to call a nuclear strike? Sure. Have five hundred million in reserve. No one ever said it was easy to be a world leader. If anything, it’s bloody expensive. Guerrilla warfare, on the other hand, is not. In fact, compared to everything else, terrorism is almost mind-bogglingly cheap. You’ll only need to spend ten million in order to send your incendiaries anywhere in the world. As an added bonus, you won’t have to worry about weathering retaliation either – radicals in this game are rather close-mouthed about their affiliations. For the sake of decorum, I’m going to forgo discussing the political aspects of the game. You can come to your own conclusions yourself. However, I will have to say that War on Terror is rather compelling. Once you’ve gotten into the swing of things, it’s easy to get caught up in the act of expansion, in worrying about the next oil turn and whether you will be a prince or a pauper. Do you play nice with your neighbors or do you move for the kill? Do you spread like a venereal disease or do you focus on building up the nations under your control? Like any good iOS game, it’s simple but prone towards provoking ‘one more turn’ instincts. Graphics-wise, War on Terror will likely be a hit or a miss. If you enjoy the political cartoons in the newspaper, you’ll probably like it. If not, well, it’s not intolerable. It’s just not something to shout about. 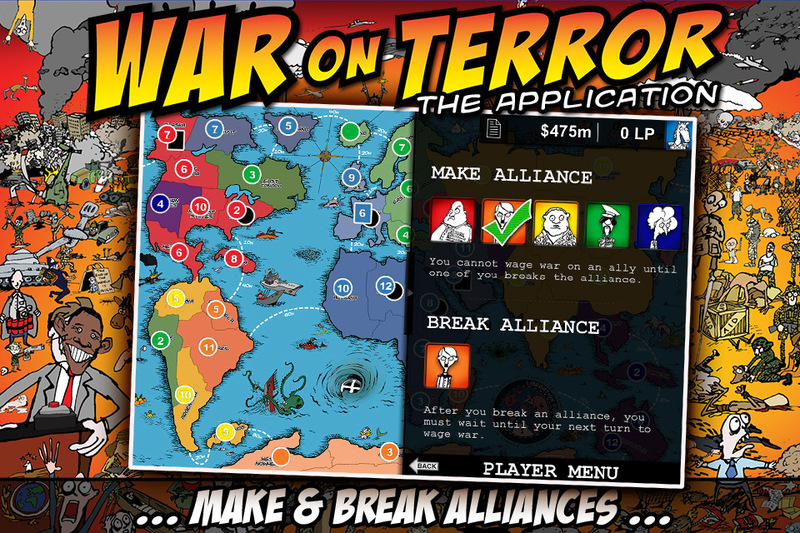 As I’ve mentioned before, War on Terror is a game that you need to experience at least once. But only once. Re playability is a big issue here for me. After beating it once, I feel little imperative to do so again, an odd turn of circumstances given that War on Terror was derived from a board game. I imagine that this opinion might change once online multiplayer (hot seating could have worked brilliant too, guys) is introduced but for now, it is a problem. 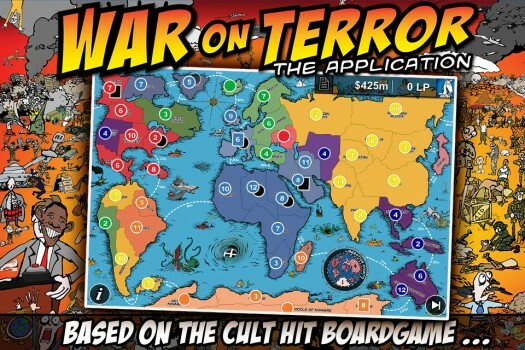 Still, if you’re willing to overlook that, War on Terror remains a rather brilliant if possibly misguided piece of political satire and a rather entertaining game to boot.